You know, a trip to the eye doctor can be kind of fun, but let me tell you… recovering from same is less fun. Specifically, recovering from the dilating drops is no fun at all. I had two different eye exams over the course of the week. One was the standard checkup-type eye exam on Wednesday, and the other was with a specialist on Friday (don’t ask, but I’m not going blind). And in both cases, they give you the little drops to dilate your eyes, in order to be able to see what’s going on inside and make sure all is well. The problem, of course, is going out into the real world afterwards, still dilated and all. 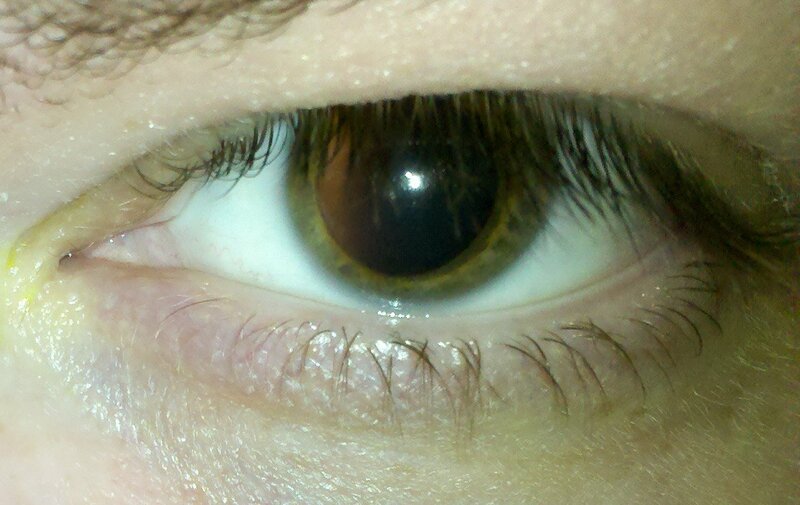 Wednesday’s dilation was fine because it was raining out. Thus going home afterwards was fine since the sun wasn’t out. However, for Friday’s exam, it was cloudy in the morning, but after working a half-day at the office and going to see the doctor, it cleared up and was a beautiful day again. It would, of course, normally be beautiful for me, too, except that I would be practically blinded by it all. Yes, they gave me the little horn-rimmed dark inserts that sit behind your glasses in both cases, but they don’t work all that well because they move around a bit and cause their own reflections. As you can see, my pupils were many times their usual size in that kind of lighting. Also, in both cases, the yellow goop in the corner of my eye is left over from the numbing drops that they use to test eye pressure. Then to add insult to injury, on Friday, they put the drops in, sent me to the second waiting area for people going to dilate, and then when it was time to go to the exam room, they put me in a room with a large fluorescent light fixture directly overhead, practically blinding me. So I turned the light off and waited for the doctor in the dark. 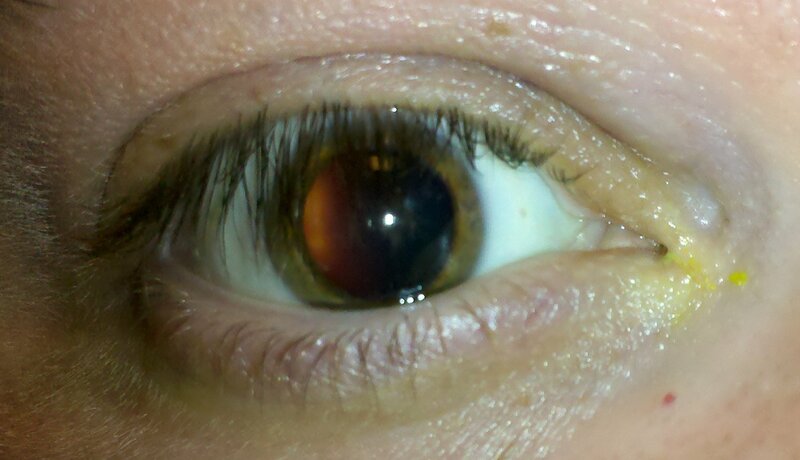 I was dilated, so I could see just fine without it, after all. Even the doctor agreed that the light’s placement was poor planning, as well as the fact that, with dilated patients in the room, there was no “mid” setting. You go from full on to total darkness. Hope they fix that next time I come over there. Then the Metro ride was fun. When I go see the specialist, I drive to Shady Grove, park, and take the Metro from there, since everything I need is on the “A” side of the Red Line. My office is near Dupont Circle, and the doctor is by Friendship Heights. This is one of the times I was glad that Metro stations are dark. This would also have been a good time to get a Rohr or a 4000-Series, because the interior is slightly darker than on a newer car. But no, I got a Breda rehab – specifically Breda 3172. That was bad enough, and then came Grosvenor. The train goes above ground just ahead of Grosvenor. Blindingly bright despite the horn-rimmed shades and my doing my best to position myself away from the sun. Once I was back in my car, I was doing all right. I didn’t have any direct sunlight on me in my car, and the shades did a good job getting home. But in the end, all is well regarding my eyes. I will be getting new glasses, most likely some time next week. I deliberately decided to put glasses shopping off until next week, because I’m going to the One Nation Working Together rally on Saturday, and I am not about to go to a political demonstration with new glasses that have a new prescription on them. I remember in 2005, it took me a week to get used to the new glasses. I am not going to go to a protest and be all falling down on account of new glasses. And I’m pretty sure that this will be a tame enough event to where wearing glasses will be fine. I know a few black blocs that I’ve been in where I definitely wanted to put my glasses away and kept them packed until I was safely away from the demonstration. Plus glasses tend to fog up when you’re masked up. I don’t expect to see a black bloc form for this demonstration (but I always reserve the right to be surprised), nor do I expect there to really be a need to mask up anyway. After all, I don’t work for an organization like Walmart anymore that would potentially fire someone for being friendly on unions. Truth be known, I masked at the Million Worker March primarily so that I could control how identifiable I would be in others’ photos due to the Walmart connection, though I admit I probably negated my mask a few times (mask negation described in detail in Funk the Weekend, Part 1), but hey, no one’s perfect, and my Walmart days are long over. So all in all, this ought to be fun. I hope that Randi Rhodes shows up for this one. I would love to meet Randi and potentially also meet The Howard. Plus I would love to pull out the Droid and show Randi my “Bounce Your Boobies” tribute video. After all, imitation is the sincerest form of flattery, as they say. And then Randi’s Friday show from last week (I listen to the shows a week behind on podcast), which I listened to today, Brother David called in during the first hour, which threw me off a bit, since I usually listen to the first hour in its entirety in the morning. Brother David normally calls in near the end of the last hour, which I listen to in the evening. So “gorgeous girdles for everyone” as per usual on Friday, but way too early in the day. So if you’re coming to One Nation Working Together on Saturday and see me, say hi to me. I should be fully un-dilated from the eye exams, and who knows – you might even wind up on Schumin Web. Song: Appalachia Rising last Monday in DC, which I was unable to attend. Quote: Oh, and by the way, I found a new bank. I am now a member at MCT Federal Credit Union, and now the fun part begins: determining when to change what over from Bank of America to MCT, and determining when to finally turn out the lights at Bank of America. And truth be told, I won't miss them. I'm going to be glad to go to a small bank. Bank of America has a lot of baggage, and they jacked up my credit card interest rate for no reason (I have never not been in good standing with them). So the hell with Bank of America, though the transition process will likely take months to complete.